We've been creating freely available game assets since 2014 and there's already 40,000 of them available! New content is created every month and all assets are completely free to use in personal, educational and commercial projects. This allows developers all over the world to use them in their projects. Your support means that we can keep creating new game assets and thus provide students, indie developers, teachers and professionals with high quality graphics, audio and fonts. Every pledge is appreciated, no matter how big or small. You can access all of these rewards directly after pledging! Pixeland is a community for indie game developers which you're more than welcome to join. There's a local venue where developers can meet-up, work, create, play, share and learn. Learning material, resources and guides are created and shared for free online. Visit and join the open Discord channel! Asset Forge is a tool which allows anyone to create 2D and 3D assets using easy to use tools, by pledging to our Patreon you support further development and updates. Game assets can take a long time to create, and to satisfy all users there need to be many, covering all genres of gaming. We've already released over 40,000 assets but there's still many more to create. We're creating 2D sprites, 3D models, audio files, fonts, textures and much, much more. The assets can be downloaded for free on our website, once the first milestone has been hit we'll remove all advertising on our website. You can find more information about us and our studio at Kenney.nl. 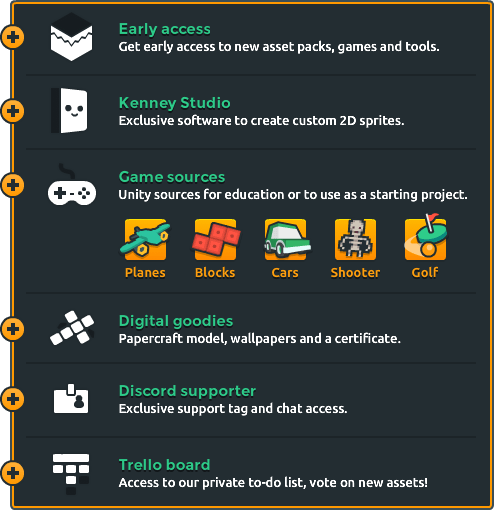 Support Kenney and get access to our private Trello board which lists all game assets currently in production. Get access to exclusive content and get new assets early. Access to all supporter rewards!